Disclosure of Material Connection: I have not received any compensation for the post below. I have no material connection to the brands, products, or services mentioned. The host may have received compensation or applied affiliate links. Participating bloggers are not responsible for the awarding of the prize. Sponsor and/or host blogger is responsible for prize fulfillment. The odds of winning are based on the number of entries received. Confirmed Winner(s) will be contacted by email. Winners chosen via Random.org. This giveaway is no way sponsored, endorsed or administered by or associated with Facebook, Twitter, Pinterest, Google, or any other social media network. No purchase is necessary to enter. One entrant per household. Void where prohibited by law. I am disclosing this in accordance with the Federal Trade Commission's 16 CFR, Part 255: "Guides Concerning the Use of Endorsements and Testimonials in Advertising." 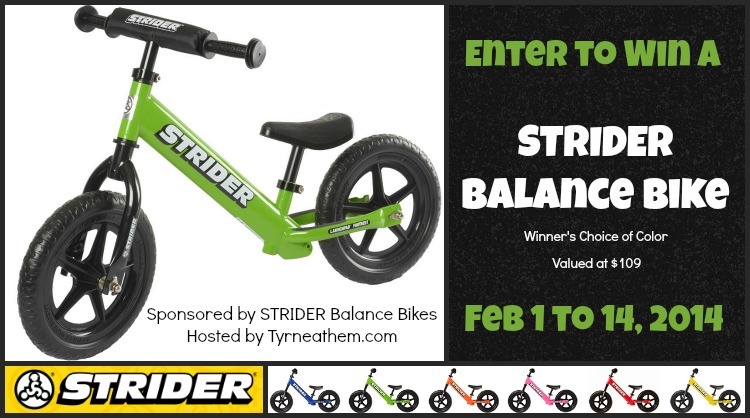 Spin on in and find your balance with our STRIDER Bike giveaway! Eligibility: US residents age 18+ only. If your toddler can walk, a STRIDER will get your toddler cruising over dirt, grass, and pavement with ease. Designed to be steady, stable, and safe, the STRIDER ST-4 bike is perfect for children from 18 months to 5 years old. Healthy kids develop essential motor skills early in life. Pediatricians agree that learning balance, coordination with exercise jump-starts a child’s growth and development. The ST-4 teaches your child balance, coordination and develops glittering confidence. Trikes and bikes with training wheels don’t. Traditional bicycles place too much of the focus on learning to pedal — skimping on developing your child’s motor skills. One lucky reader will be riding away with a STRIDER St-4 in their choice of color! Open to residents of the US only. Must be 18 years of age or older to participate. All entries are optional, but completing more entries will increase your chances of winning a prize. Winner will have 48 hours to claim their prize or another winner will be chosen, so please watch your email! Please read full terms and conditions on the form before entering. If you are a company and would like to see your brand advertised in an event similar to this, please contact Tyrneathem. Did you enjoy this post? Is there a burning issue you'd like to discuss? I'd love to hear what you have to say! You do not need to create an account to comment. i would choose orange for my son! I love the pink! It’s my daughter’s favorite color. I like the green and orange. Hard to pick. Maybe green.